True story: I once asked directions from a man I met in Dublin. I asked him how to get to a particular address in the city. He told me, and I quote, “You can’t get there from here.” For a moment, however brief, I thought all was lost. Many of your clients feel the same way. They can’t travel because it costs too much. They can’t travel because they don’t have passports. They can’t travel because they are afraid of terrorism, norovirus, foreigners, all things German, and strange food. They need some new appliances. Really! No, not really. In reality, they can’t travel because of you. They don’t think they can get there from here. Listen. It’s your job to train your clients, right? Why haven’t you explained travel to them? Why haven’t you taken the time to remove their obstacles to travel? Why haven’t you marketed your heart out, marketed so hard they have heard your message? We know now what stops your clients. What stops you? Ask yourself if you would rather have a week in Paris or a new washer and dryer. I would choose the trip, and so would most of your clients. If we began to talk travel, we would talk for an hour and be jazzed for the adventure. 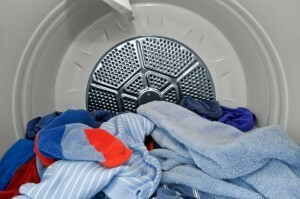 When was the last time you talked about your washer and dryer? Snooze. You have to hit the emotional hot buttons when you market travel, because our sense of adventure lives on the imaginative side of our brain. Travel matters. If your clients have problems keeping them from traveling, it’s your problem as well as theirs. Let me tell you what to do about it. Quit making excuses for you and them. Market your heart out. Act like you mean it. You owe it to your clients. Otherwise they will have truly wonderful laundry, and nothing interesting to talk about in the locker room. 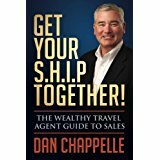 Speaking of “Getting there from here,” I want to also be sure you know about a terrific resource you may want to pick up and read, Dan Chappelle’s new book Get Your S.H.I.P. Together. One of the great things about our industry is the presence of so many excellent business coaches, and Dan certainly fits the bill. Dan’s latest venture, The Wealthy Travel Agent, is the home port for his consultancy, and he has condensed many of his most important concepts in his book which is filled with personal stories from Dan’s varied travel career. Dan stresses an important point: if you are going to rise above the “average” in the travel profession, you cannot do what everyone else is doing and you have to seek out and emulate other successful agents. Dan advises his clients and readers to face their own fears, to be brutally honest with themselves and to plan appropriately. Dan’s writing style is frank (to say the least) and direct. He understands the mindset necessary to success and will give you a good roadmap to getting there. I highly recommend you pick up a copy.